One of the questions I am asked most often is how to extend short naps. I see a lot of parents who have babies sleeping 20-30 minutes for each nap. But then baby wakes up grumpy because they could really do with more sleep. When a baby doesn’t get enough sleep during the day, it affects how they sleep at night. This situation can snowball as you try to help your baby catch up on lost sleep. You’ve tried to get him to sleep in the cot, but in hopes of a longer nap, you do what works. So you take him out in the pram or car, or you just hold him. But there comes a point when those things stop working too. This happens because, while sleep props initially help a child to sleep, over time they lose their potency. A baby that might need only a few minutes of rocking to go down for a nap. But as time goes on, they need 30-45 minutes of rocking to take that same nap. In this situation, we need to give our babies the opportunity to practice these new skills in an optimal environment. That environment is one in which all of their other needs have been met. If your child is taking short naps, sleep props are often one of the culprits. Props mean that your child is going down for his nap drowsy or already asleep. He needs to learn how to fall asleep without you doing most (or all) of the work. The reasoning behind this is it won’t then be a shock when he wakes up in the cot after falling asleep in your arms. If he does wake up after 20 minutes and he’s still sleepy, he’ll be able to put himself back to sleep. Try and play around a bit with your baby’s awake window, so he’s tired enough to fall asleep and stay asleep for a long enough nap but he’s not going to bed overtired. 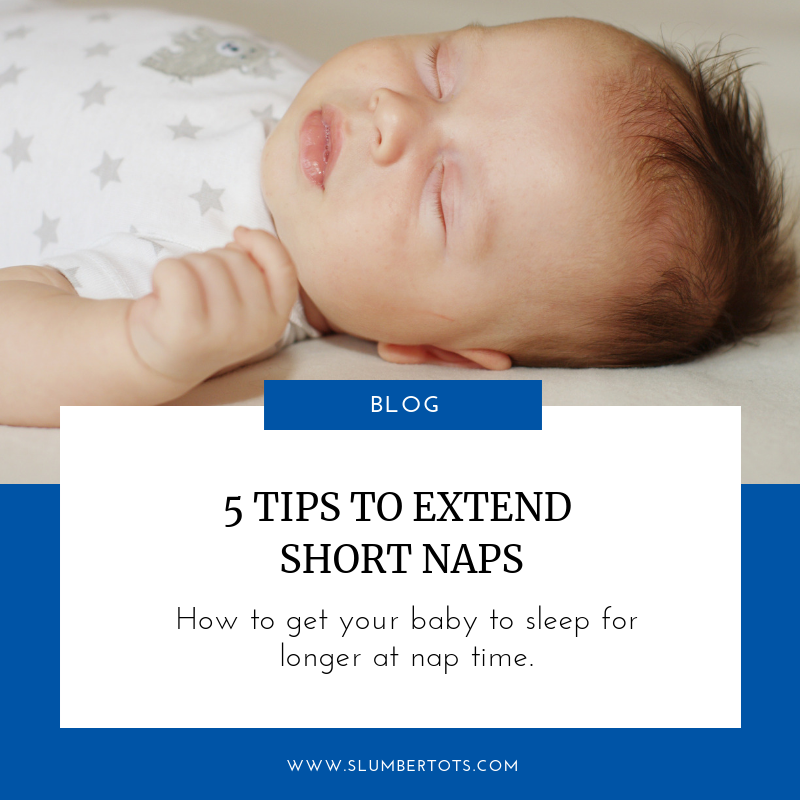 If your baby is having a hard time staying awake in the nap time routine, either he has a very strong feed-sleep association or he’s overtired. Overtiredness makes it harder to fall asleep and stay asleep, which is why overtired children have short naps, night wakings and/or early wake ups. Ideally your baby will be on an Eat – Play – Sleep schedule, so he’s eating when he wakes from a nap rather than when he’s going down to sleep. If his naps are sporadic and inconsistent, that may not be a doable schedule. But, for example, if he’s eating every three hours, and at 2.5 hours he’s ready to go to sleep, it’s usually better to feed him before the nap so he doesn’t wake up early because he’s hungry. It will be tricky to keep him from falling asleep during the feed, but if you can keep him from getting drowsy and put him down awake with a full tummy, he’ll have a much longer sleep! If your child is having short naps in the pram/car, the baby carrier or being held and in the cot, there’s no rhyme or reason to where your baby is expected to fall asleep. Children learn best through repetition, so putting them down for naps in the same place (as much as possible) helps them learn that when they’re in the cot, they’re supposed to fall asleep…unlike a pram when sometimes they’re going on a walk and looking around, and sometimes they’re falling asleep. Sometimes if you can catch your baby just as they’re waking up, you can help them back into another sleep cycle. If your baby always wakes after a certain period, e.g. 30 minutes, try going to them a few minutes before that. Pat or rub their back a few times and make a shushing sound to help them back to sleep. Try this for a few days. If this isn’t successful, I’d suggest waiting a few minutes before going in. If that goes by and they’re still not back to sleep, then get them up. Once you’ve put the above tips in place, you should see short naps extending longer within 2-6 weeks. If you feel like you need further support, please feel free to book a call with me, or email katy@slumbertots.com. We can discuss a tailored plan to suit your needs.